We encourage you to place your order by phone using our toll free order line 800.882.8750, especially if you are uncertain regarding your needs and have questions we can help you with. You can also fax orders to us at 520.882.7947. You are also welcome to email us with questions regarding our products and their applications. Our store hours are Tuesday - Friday: 9 AM to 5 PM and Saturday: 10 AM to 2 PM Arizona time. We are closed on Sundays and Mondays. To better service our mail order customers, we're bringing several of our product catalogs online and providing Internet ordering capabilities. We provide secure online ordering for users of contemporary versions of web browsers like Microsoft Internet Explorer, Safari, Firefox and Netscape Navigator. AOL users are encouraged to phone, fax or mail in their orders as our online ordering is incompatible with AOL due to problematic handling and reassignment of IP addresses by AOL. First: Click The (Place In Basket) button located near the product. After uploading an item to your shopping cart, you'll be presented with this form containing a summary of the items currently contained in your basket. 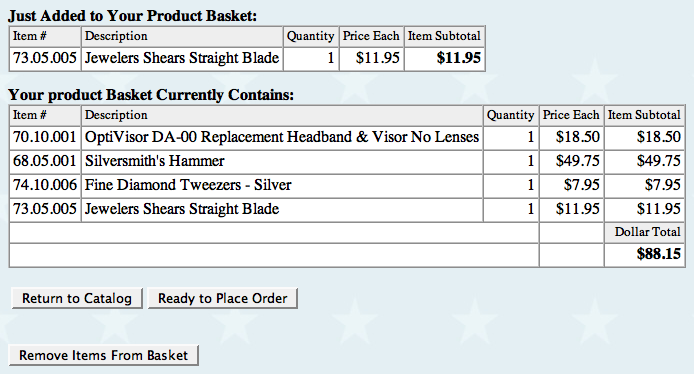 Use the "Return to Catalog" button to continue shopping and adding other items to your online order. To delete an unwanted item inadvertently added to your basket, use the "Remove Items From Basket" button. To edit your quantity or inches of any given product silver gold etc. use "Return to Catalog" and enter the desired quantity or inches of the product needing change. Note: we use four seperate baskets. Product Basket, Silver Basket, Gold Basket and Gem Stone basket at final check out all baskets will be added together for the subtotal only. When you are ready to place your completed order, click the "Check Out" or "Ready to Place Order" button. To provide the most current and competitive prices on metals, our Gold Filled, Sterling Silver, Fine Silver and Silver Solder metals product prices are calculated using the current spot (commodity) price of gold and silver, with quantity discounts provided based on the total combined ounces of gold filled or silver products ordered. Special order wizards automatically recalculate the total weight of your gold filled or silver product orders and refigure quantity discounts as you place your order.